Face it – most people think that wipes are just a thing for babies, an essential item to clean them whenever they get dirty or they need a diaper change; however for many parents, having the right baby wipes is an important factor to clean the baby’s sensitive skin during a diaper change or whenever he gets dirty. A wrong variety of wipes can lead to skin irritation, increased diaper rash, and other health concerns. Since a vast range of baby wipes are already available in the market and some of them might be made from harmful ingredients. 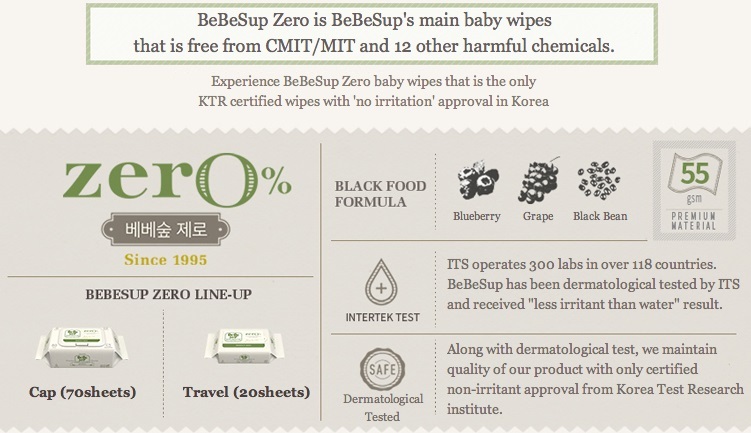 BeBeSup Zero Cap is BeBeSup's main baby wipes that is free from harmful chemicals. Suitable for general application. Safe for hand and face, safe for newborn and everyone. Suitable for general application. Safe for hand and face, safe for newborn and everyone. Black Food formula (Black Bean, Grape and Blue Berry) extracts with anti-inflammatory, regeneration, skin stabilizer and help in elasticity properties. Comes with 80 sheets per pack, 200x160(+/-5mm), 55gsm per sheet, soft, thick and smooth surface.